When loyalty points aren't enough... The Barclay Arrival Card and Zeno's Paradox. This morning The Frequent Miler discussed the pain that comes into every points & miles collector's life when they have to stay at a non chain property that neither accepts nor offers points or miles. Whether it's a B&B, a cruise line, or to use an example Mrs. Pointsninja and I have just encountered, the Peru Rail, sometimes your huge stash of airline and hotel points is just no help at all. That's where cashback travel cards come in. The most well-known of these cards is the Capital One Venture card, thanks to the Vikings and one of the Baldwin brothers. The card offers a straight 2mpd return, and the miles can be redeemed for a 1cpm rebate against travel purchases paid for with the card. A few years ago the Capital One made a big splash with their "Match My Miles" sign-up promotion in which the sign-up bonus for getting a venture card was up to 100,000 Venture Miles ($1,000). I jumped on that offer for the bonus alone, but since then I've found that my Venture Miles (accumulated primarily through manufactured spending) are a very useful tool in the Pointsninja's utility belt. Enough so that I've actually paid the $59 annual fee to keep the card after the first year. A Travel purchase is defined as: Airlines, Travel Agencies & Tour Operators, Hotels, Motels & Resorts, Cruise Lines, Passenger Railways and Car Rental Agencies. However, unlike the Venture card, the Arrival card offers a 10% rebate on redeemed points. Initially, I thought the benefit was similar to Chase Ultimate Rewards bonus for redeeming points for travel. That benefit is of limited utility since it requires you to book your travel through the UR website. I've found the prices there to be consistently and significantly higher than elsewhere. Now, with the benefit of having the full cardmember agreement an access to the Barclay website, I see that Arrival card redemptions work more like Venture mile redemptions. So, if I redeem 30,000 Arrival miles for a statement credit to cover my $300 stay in Peru, I'll get a nice little rebate of 3,000 miles ($30). Of course, I'll get a 10% rebate when I redeem those miles as well, and so on (though, with apologies to Zeno, I don't expect Barclay to rebate an infinite number of fractional miles). What this means is that the Arrival card give an effective 2.2% rebate. 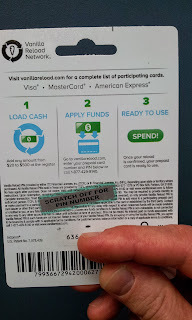 This beats any (non-bonused) cash-back card out there, including the Fidelity Amex (2% straight cashback). The card currently carries a 40,000 mile sign up bonus for spending $1,000 within 90 days and the annual fee is waived the first year. It looks to be a significantly valuable card from a bank that doesn't have a lot of travel cards. 2. Accumulate A LOT of points and miles. For most people, the second option is the more realistic. Unless you're a frequent business traveler, if you're going to pursue that strategy, the single most important arrow in your quiver is a strong credit score. That's because the easiest way to accumulate miles and points through credit card sign on bonuses and credit card spending. Today I'd like to focus on applications and what they can do for you. I divide travel related credit cards into three categories; airline cards, hotel cards, and travel reimbursement cards. Airline cards get you there, hotel cards give you a place to stay, and reimbursement cards can cover a lot of your other expenses. In a recent round of applications, I covered all three bases. When considering new cards, my first stop is usually The Frequent Miler's website. He does a pretty good job of keeping track of the best travel related credit card offers out there. One of the things I appreciate about TFM's site is that he, like Gary at View from the Wing and Lucky at One Mile at a Time, will usually direct you to the best offer out there, rather than simply promoting a referral link that will earn him money. You can find links for all the cards below at TFM. 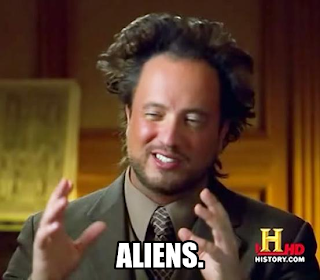 My first card application was for the Chase United Airlines Explorer card. As TFM points out, the best current offer is 50,000 United miles for spending $2,000 in three months after getting the card. The card has no annual fee for the first year. and, using Manufactured Spending techniques, the initial spending requirement is no problem at all. The card also offers 5,000 miles for adding an authorized user, so ordered one for Mrs. Pointsninja. While I don't have immediate plans for using the miles, they'll go into my existing United stockpile where they'll eventually be used for TATL travel, hopefully in Lufthansa (LH) First Class. At 135,000 miles apiece for LH F, I'll need every mile I can get my hands on! Second, I addressed the hotel situation. This wasn't a new application, but rather an "upgrade" to an existing card. A couple of years ago, I signed up for the Amex Hilton Surpass card in order to earn Hilton Diamond status. When the annual fee came due, I "downgraded" the card to an ordinary Hilton Amex card, which carries no fee. However, when I logged into my Amex account, their card comparison tool, showed me that I was eligible for a 50,000 point bonus if I "reupgraded" my Hilton card to the Surpass card. I took them up on the offer. I'll end up paying a pro-rated $75 annual fee, but 50,000 points with no hard credit pull is nothing to sneeze at. Finally, I went for the Barclay Bank Arrivalcard. The card is fee-free the first year and comes with a 40,000 point signup bonus for spending $1,000 in the first three months. The card earns 2ppd that are worth 1cpp when applied to travel expenses, so the bonus amounts to $400 in reimbursable travel expenses. I'll use that for covering things like award booking fees, rental cars, hotel meals, and other miscellaneous expenses that come along with "free travel." My credit score will likely take a 5-10 point hit for these new applications, but that will drop off in less than a year. Meanwhile, I've earned another 145,000 points and miles for future trips! A recent Flyertalk thread clued me in on Square Cash, a new player in the webpayments game. The thread is HERE. Square is a reputable service, and their new offering is a fee-free way to send up to $2,500 per week to anyone. The limiting factor is that payments can only be made with debit cards and not many debit cards award miles or points. Suntrust's Delta debit card is a good option here at 1 Skypeso per dollar, and I plan to try it out. This may also be a way to liquidate some prepaid debit cards. Early reports indicate that the Paypal debit card works with Square Cash, but other prepaid gift cards are reported not to work. However you use this service, I advise caution. In my experience Square is quick to jump on perceived "abuse" and close down accounts. Many folks who used Square credit card readers to cash out gift cards in the past were frustrated by account closures and Square's "fraud prevention measure" of holding balances for 30-60 days. UPDATE: Test transaction has posted as a "Debit Card Purchase." Game on. Amex will send you a confirmation tweet if you've successfully registered, and then its time to save! Of course, there is also a Manufactured Spending aspect to this and many other Sync deals. Lowes has a fairly respectable gift card rack, and carries cards that can either be used for ordinary spending (Amazon) or even resold for a slight profit (gas cards). American Express and Tripadvisor Partner Up- $5 Statement Credit. I'm pleased to read on One Mile at a Time today that Amex and Tripadvisor are partnering up for some promotions. The initial deal is a $5 statement credit for linking your Amex to Tripadvisor and writing your first review. Since I use Tripadvisor anyway, this was a no-brainer for me. Sign-up is here, but is "limited" so get it while you can. And, looking at the Amex/TA page, it seems that they will be doing some "sync" offers here much like they've done with Twitter and Facebook. The ones currently on offer are quit appealing: $50 back on a $250 Amex travel booking, $10 back on a $50 California Pizza Kitchen purchase, and $25 back on $100 at The Palm. It looks like Amex will continue to be the most generous "free money" card for the near future. Machu Picchu Tickets- or - Machupicchu.gob.pe, I Hate You! Seriously, though, Machu Picchu is an incredible place and we knew that we wanted to tick it off our list. In the past, access to Machu Picchu was essentially unrestricted, but in recent years the Peruvian Ministry of Culture has limited the number of daily visitors to 2,500. Visitors to Huayna Picchu, the mountain that adjoins and overlooks Machu Picchu, are limited to 400 daily. What that means is that its not safe to just show up in Aguas Calientes (the nearest town) and assume that you'll be able to visit the ruins. So, you need to get tickets first. I'm a modestly seasoned traveler and, at first, it seemed that the process would be straightforward. After all, there is an official Peruvian Ministry of Culture website that does nothing but sell tickets to Machu Picchu and other sites. That website www.machupicchu.gob.pe was the beginning of my downfall. First of all, the website is in Spanish, of which I have the most modest smattering. But look! Up in the corner is that boon to monoglots, the little flags that let the user select for English. Easy, right? Not so fast! For some (possibly xenophobic) reason, the site will not let you reserve tickets if you choose the English language option. I suppose you could use google translate, but after several abortive attempts to use the English version of the site, I had most of the fields memorized and just went through it in Spanish. The process of booking tickets on the site is needlessly complex. First, the user selects which site they want to visit. I chose Machu Picchu + Huayna Picchu. Second, the user must make a reservation by inputting their name, age, nationality, and passport number. So long as you're on the Spanish language version of the site, you can then generate a reservation number. The user then has six hours to pay for the tickets or the reservation expires. Prices are in Peruvian Soles and Machu Picchu + Huayna Picchu costs around $52. Payment requires you to go back to the first page of the website and select the "PAGOS" tab. That tab will prompt you to enter your reservation number which will then take you to the payment processor. However, they only take Visa, and, allegedly, your Visa must participate in "Verified by Visa", a supplemental security program. It seems that this requirement is due to fraudulent use of credit cards to purchase Machu Picchu tickets. However, since your ticket will bear your name and passport number and may not be used by anyone else, the security concern seems rather excessive. Anyway, businesses and governments have been accepting payments over the web for years, so paying for these tickets should be no problem, right? WRONG. Google "can't pay for machu picchu tickets" then read all the results. <two weeks later> See what I mean? Because I'm a mileage addict, I have visa cards from Chase, Barclays, US Bank, Citibank, and Capital One. I tried them all. None worked. But I'm a persistent guy. So I tried again, and again, and again. For a week. Finally, I started looking for other ways to buy tickets. Most hotels and any tour operator will book tickets for you, for a modest fee. My hotel in Aguas Calientes charges $170 for a (guided) ticket to Machu Picchu. Ay caramba! I tried some more. Finally, I gave up and decided to go through an agency. But which one to pick? I read many posts on Flyertalk, Tripadvisor, and other sites. I did a lot of googling. 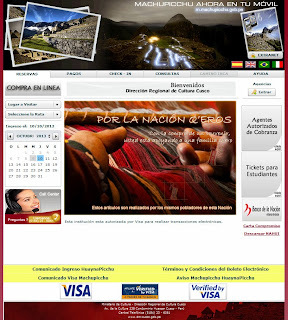 Finally, I settled on http://machu-picchu-entrance-tickets.com/ a website operated by the tour company Totally Latin America. I chose them because, at the time, they were the cheapest option I could find. Tickets for Machu Picchu + Huayna Picchu were $74 each. That price has now increased to $82. A ticket for just Machu Picchu is now $72. The booking process with TLA was fairly smooth, though it cannot be completed on their website. Essentially the website works like an information form in which you provide TLA your desired dates of visit, name, passport #, and a convenient time to call you. Payment is made over the phone. I talked with a friendly British expat who took my payment and got the tickets to me the next day. I'm told that they are looking at making online payments available, but as of press time, that hasn't happened. In the end, I got the tickets I needed, but I had to pay a bit more than I wanted to. Still, it was certainly less than I could have paid. Small victories, Pointsninja, small victories. Now, having gotten over this hurdle, we're set for our trip and I can't wait to post some spectacular pictures here! Like many other folks in the points & miles world, I've been using a combination of Vanilla Reload cards and Amex's Bluebird card to "manufacture spending" in order to generate miles and meet initial spending requirements. 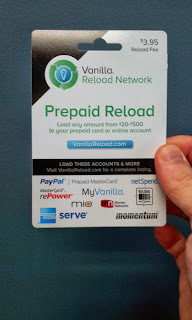 If you don't already know, Vanilla Reload cards can be bought with credit cards at some locations, most notoriously at some drugstores. VRs can then be used to reload a variety of prepaid debit cards, such as the Bluebird. The Bluebird can then be used to pay off the credit card with which you purchased the VR. They are a fantastic tool in the Pointsninja's arsenal (and not just because they can be flung like shurikens at your enemies), at least when you can find them. However, as discussed at length in this Flytertalk thread, VRs have a significant security flaw. 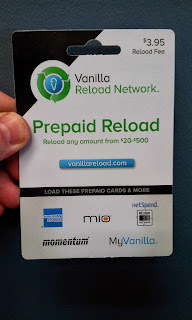 When you activate/load the card there is a ten-digit code on the back of the VR that you use to reload your prepaid card. 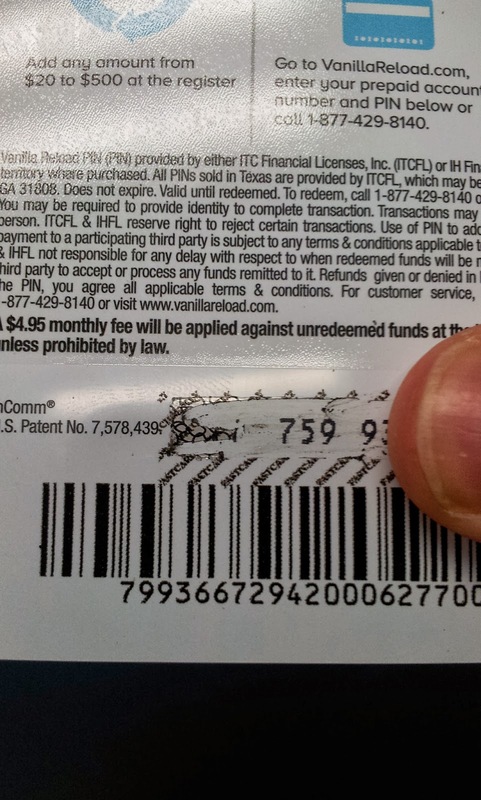 On older VRs, that code is covered by a gray "scratch off" strip. However, as some have observed, the strip can easily be removed with a razor blade or other implement without leaving a mark. Here you can see that I've removed the strip and reattached it to a different location on the card. 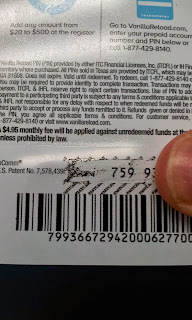 A criminal could just as easily remove the strip, write down the code, replace the strip, and leave it for an unsuspecting customer to purchase. The security strip on the back of these cards cannot be removed by a razor blade like the old cards could. This was a much-needed improvement and should help thwart the type of fraud discussed above. Well done, Vanilla.